My first recollection of the politician Bashir Lala is from a 1977 election poster, when I believe he was contesting a provincial assembly seat as the National Democratic Party (NDP)/Pakistan National Alliance candidate. The PNA ended up boycotting the provincial elections. But Bashir Lala and his older brothers Haji Ghulam Ahmed and Ilyas Ahmed, presently a federal minister and senator respectively, had joined the National Awami Party (NAP) — and by extension, the Pashtun nationalist movement — somewhere in the early 1970s. His younger brother, Aziz Bilour, remained in the civil service and never joined politics, though there came times that all four brothers were imprisoned by the government of the time for their political affiliations. The NAP was banned and disbanded, but Bashir Lala and his family remained committed to Baacha Khan and Wali Khan’s political thought. The ANP was formed in 1986 after the merger of the NDP, Mazdoor Kissan Party, Awami Tehrik and Pakistan National Party. Bashir Lala was to later become the provincial president of the ANP. Today, Bashir Lala is remembered for the five consecutive elections he won. I saw him at his finest after his first election and the first and only election defeat in 1988. He was as gracious in defeat as he was in his five wins. 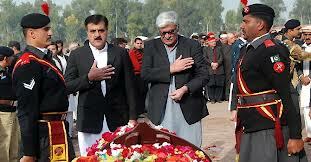 The ANP morale was down, as it was routed in the 1988 polls in Peshawar valley. That is where the workhorse Bashir Lala came into the picture. He crisscrossed Peshawar’s alleys to reach out, support and encourage the party cadres. If his oldest brother had the social suave to reach out to the Peshawar families, it was Bashir Lala’s political muscle that held together the ANP election machine in Peshawar from the non-party-based local bodies election of the 1980s to a thumping victory in the 1990 general elections. Peshawar city has traditionally been a stronghold of the assorted Muslim Leagues and then the Pakistan People’s Party (PPP). Having lost his first election to Syed Ayub Shah of the PPP, Bashir Lala was truly the architect of the Pashtun nationalists finally wresting away Peshawar from the League and the PPP. While deeply inspired by Wali Khan, he was an extremely effective traditional politician who understood the complexities of a large city and the problems of its people. He reached across language and sectarian barriers and stood up for his constituents regardless of party affiliation. But he was one of the few leaders who were readily accessible to party workers whenever they needed him.